Everyone knows James Bond. Without a doubt he's one of the single most recognizable and symbolic figureheads in cinema history. Even his worst films develop a religious cult following that sustains to this day. Of course Bond is just a name. It's what one does with that name that makes their Bond truly special. Which is why I love Daniel Craig's Bond. Not that I'm saying his Bond is wholly of his own creation (after all there are writers, producers, and directors whom I'm sure have a considerable say in that department). But the way James Bond has developed over his three films feels much more like a James Bond that is in fact developing. I wasn't that big on Quantum of Solace but the film did take the James Bond created in Casino Royale and add to it. Skyfall carries that same mentality and molds it to fit the new environment. After all it's way too easy for Bond films to just become a rehash of the same story over and over again. In many respects that's also a bit of what people want from a Bond film. Skyfall recognizes this and does its absolute damnedest with it. Like it or hate it, Skyfall is a Bond film that tries its best to simultaneously rewrite the series while keeping all of the key plot points one expects from a Bond film. All the ingredients are there in the proper place but the feeling is all different. So I was not surprised in the least when I exited the theater to find such widely differing views on the film. For my own part, I dug what it was doing but not always in the manner it chose to do it. I disagree that Skyfall is a tearing down of James Bond, but rather a continuation of the effort to humanize him this series has made. He's not invincible, always right, or the man with the plan. Daniel Craig's Bond is a hunter. Give him a target, a location, and the tools and he'll get the job done. Skyfall knows that. It starts with that. Then it takes all of that away and turns James Bond from the hunter to the hunted. It's not the most innovative switch on the planet, but Skyfall handles it marvelously. It also gives us a chance to explore Bond's inner feelings. Well, to an extent. If there's one thing that I wish Skyfall had done was more exposition. To some that complained it was slow that might sound bonkers, but I always felt like Bond's reasons for acting the way he did were left just a bit too grey. Does he see M as a mother figure? Is it simply loyalty? If so, to who? Country? M? Is it a constant need to prove himself? Certainly the cocky, naive Bond that first blessed the screen in Casino Royale has been completely demolished. Skyfall spends a lot of time explaining what it doesn't ultimately develop about James Bond. There's a lot of back story. A lot of building and crafting. The timeline from his childhood to his working for M is spun and twisted into life. Yet for all that we're told, we're never really given the necessary moments to pull it all together. There's a very valid argument to be made that in the end Skyfall leaves it up to us to decide why Bond does what he does. And for a movie that spends so much time flirting with an answer, I'm not sure that's ultimately good enough. Still, I enjoyed Skyfall for what it offered. It's overall offerings greatly outweighed that ultimate lack of absolute payoff. For those who love Bond but want just that bit more then Skyfall will swoop in and be their sanctuary. 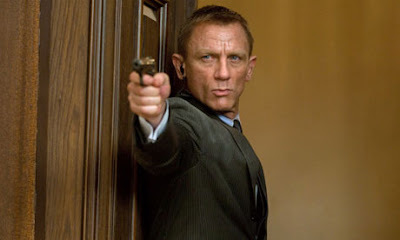 For those wishing for a complete dismantling of Bond... well, I wouldn't hold my breath if I was you. greetings from me ( Mr. Parman ).